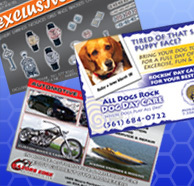 When you need to get the word out, postcards are an effective tool in any marketing campaign. Use them to target a specific audience, gain repeat business or offer a special promotion. Potential clients are more likely to read a postcard than a solicitation letter – and they are less expensive to mail. Our full color postcards are available in a variety of paper stocks to suit your needs. Gloss: Coating has a shine, smooth finish, not suggested for writing on.